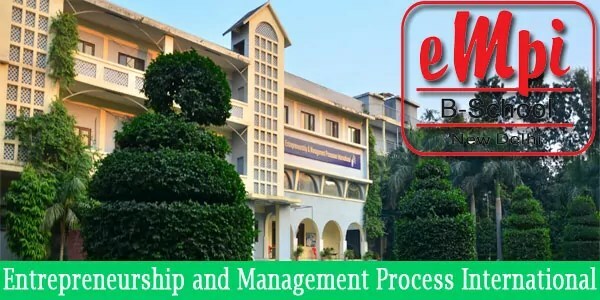 EMPI Business School Delhi was established in 1995, by a group of nation builders who have been highly committed and successful professionals College and academicians in their own respective domains. EMPI Delhi Business School conceptualized by cognitive scientist Pankaj Saran, was initially inspired and supported by legends such as Mr. Ajit Haksar, Chairman Emeritus, ITC Ltd., Col. Satsangi, Founder Chairman, CSKM Educational Complex and Mr. Gurnam Saran, Former Director, BHEL; and thereafter joined in by Mr. D.V. Kapur, Founder NTPC; Mr. N. Vittal, Enabler of the Software and Telecom Revolution; Ms. Tara Sinha, Advertising Icon, Prof. Udai Pareek, Father of Indian HR and Mr. P. S. Bami, Fmr. Chairman NTPC. Liberal arts for vision building. Technology appreciation for understanding the changing scenarios in the world today. Business skills along with the essential ingredient of business ethics leading to entrepreneurial orientation as well as humane and environmental concerns in all whatever we do. Value framework that is global yet national. Creating industrial linkages and supporting centers to generate innovation and excellence. Forge links with International and National Universities, Institutes and Centres doing similar innovative work. AIU Recognized (Association of Indian Universities). Day Boarders Rs.7,40,000/- for 2 years. Campus residents Rs.9,37,000/- for 2 years. EMPI Delhi Fees structure all Inclusive. Integrated Marketing Communication and Brand Management. A xerox of Graduation Examination marksheet (1st & 2nd year markcard for 3 year degree holders and 1st, 2nd & 3rd year marksheets for 4 year degree holders, in case applying for Final Examinations). 50 Percentile in Entrance Exams Like CMAT/ ATMA/ XAT/ MAT/ CAT .